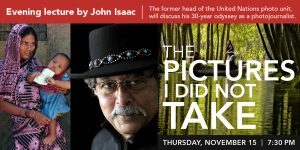 Former head of the United Nations photo unit, John Isaac, will be speaking in OSilas Gallery at Concordia College on Thursday, November 15 at 7:30 pm. Mr. Isaac will discuss his 30-year odyssey as a photojournalist with the United Nations. In his presentation, The Photographs I Did Not Take, Mr. Isaac will talk about his experiences travelling the world with the UN and some of the difficult situations he confronted as a photographer, including his effort to preserve the dignity of the vulnerable and suffering people found at the center of the many UN missions he was sent to photograph. This presentation will be illustrated with photographs taken over Mr. Isaac’s long career with the United Nations. The lecture will be given on Thursday, November 15, at 7:30 pm in OSilas Gallery and is open to the public but tickets are required. Tickets may be purchased at osilasgallery.org: $25, or $20 for OSilas Gallery members. Light refreshments will be provided. For more information, please contact Elizabeth Vranka at [email protected]a-ny.edu or 914.337.9300 x 2173. OSilas Gallery is located on the campus of Concordia College, 171 White Plains Road, Bronxville. On-campus parking is accessible via Concordia Place off White Plains Road. Please see osilasgallery.org for a full listing of exhibitions, lectures and special events at the Gallery.